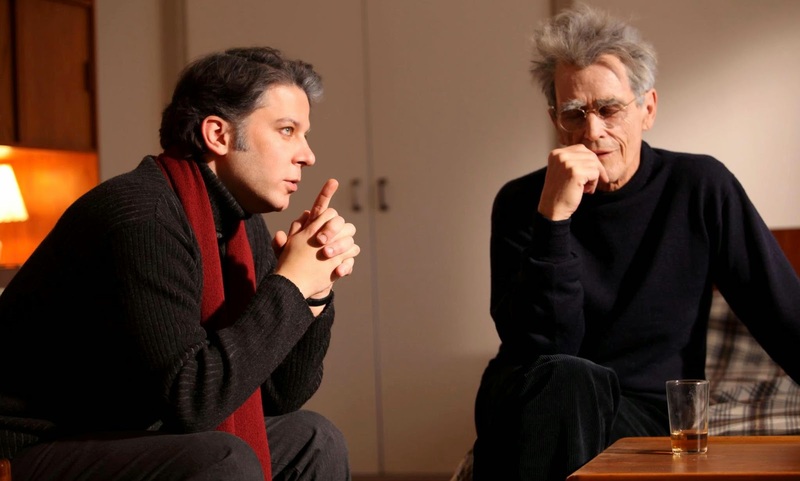 Cinemablographer: "To Each His Own Beckett"
The conceit both stumbles and succeeds. The “original Beckett” of the film slips, for one, because it simply seems awkward to honour a writer with the absence of his own words. The gap in Poet feels a bit like the lack from which Hitchcock suffered while making a film about the production of Psycho without actually showing any iconic references to the Hitchcock film itself. It’s an unfair casualty of circumstance that undermines Meetings with a Young Poet, but the film’s own reverence for Beckett just seems weird without an equally tangible sense of the words that make Beckett such an esteemed artist in the eyes of the two younger artists. The ruse works, though, because it provides the audience with a sense of Beckett and, in turn, an appreciation for why Lucia and Paul have such great admiration for the man. Meetings with a Young Poet looks less at the specificities of Beckett’s work and instead looks at how it influences future artists, for Lucia courts Paul in an effort to gain the rights to stage a production of Beckett’s play Krapp’s Last Tapes. Paul has a bit of a soft spot for Beckett and he utterly adores the late writer. Paul, to put it bluntly, thinks that this loony actress’s desire to stage Beckett’s veiled autobiographical play is heresy. The tango between Lucia and Paul then takes a backseat as Meetings with a Young Poet flashes back to the fictional friendship between Paul and Beckett in Montreal. (The setting should provide a decent flag for the looseness and subjectivity of the film.) The shift in time introduces Stephen McHattie as the salty old Beckett. 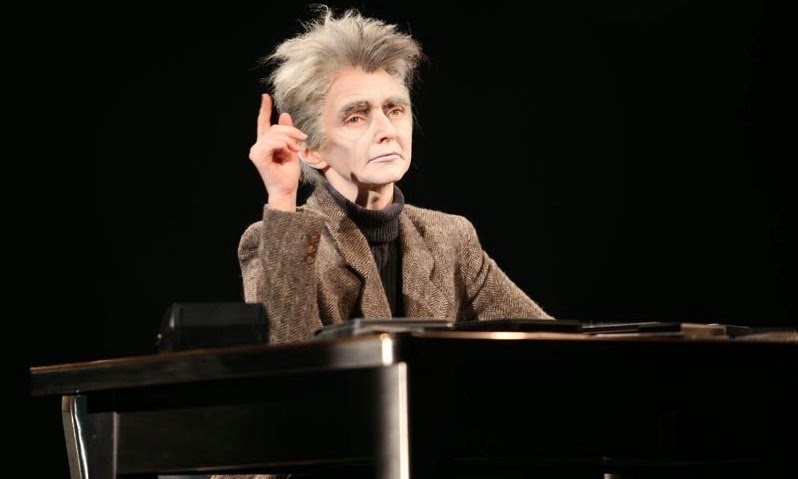 (McHattie actually bears a striking resemblance to Beckett with the proper hairdo.) McHattie is a joy to watch as his subtle performance, infused by introspective observance and dry wittiness, gives insight into the writerly process. It’s hard to explore the mind of a writer when one does not have access to his words; moreover, it’s doubly difficult to convey the creative mind on film, since the thought process is tricky to convey as engaging cinema. Hannah Arendt, for example, does it remarkably with its elongated scenes of Barbara Sukowa chain-smoking in deep thought, and Meetings for a Young Poet finds similar success in the silent moments of McHattie’s performance that punctuate Paul’s conversations with Beckett. A moment in the café, for example, provides a striking interlude in which Beckett washes himself with the sounds of the café. The soundtrack tunes out his conversation with Paul as McHattie zones out in one of Beckett’s moments of contemplation and takes in snippets of various conversations popping up throughout the café. He observes fine details of life, relationships, and character in these excerpts, and there’s a kind of poetry to the thoughtfulness of Barichello’s direction. Likewise, one of the film’s most notable moments appears in a flashback scene in France as Beckett rides a horse-drawn cart and sits in the back with a pile of turnips. His legs hang over the edge of the cart and he enjoys the sounds of the wheels turning on the gravel. One can easily imagine the writer conjuring metaphors for the ambient noise of the outdoors. It’s in moments like these that Meetings with a Young Poet finds, if you will, the poetry of life, although that probably sounds pretentious. The interludes highlighting Beckett’s mind are standout moments in the film thanks to the strength of McHattie’s performance. Alternatively, they provide a relief from the somewhat stilted conversations between Beckett and Susser, which never really shake their on-the-nose methodology for exploring Beckett via Paul. (The annoying and repetitive score doesn`t help, either.) The café scenes work best for introducing Billie (Linda Smith), presumably named for Beckett’s peer Billie Whitelaw, and her playful rapport with the writers. The meetings with the young poet, ironically, might be among the less successful scenes of the film, for Paul simply is not as interesting or engaging a character as are Beckett and Lucia. The film abandons Lucia somewhat as it goes along only to revive her for the grand finale. Her underuse is unfortunate since Maria de Medeiros’s performance might be the best thing about the film. There’s a playful flair of theatricality to her performance, as Medeiros makes Lucia shine with an actorly self-awareness and calculated performativity. She’s playing a role with Paul, after all, and developing her own version of Beckett for her take on Krapp. Medeiros is particularly good in the film’s staging of Beckett’s plays, as her realizations of “Happy Days” and especially “Krapp’s Last Tapes” are inspired moments that honour the magic of Beckett’s work through the strange comedic bent of her performance. The finale, which sees Lucia make herself over in an exaggeratedly theatrical make-up job to perform “Krapp,” is easily the highlight of the film. Meetings with a Young Poet, which is produced by Pierre Even and Marie-Claude Poulin (Rebelle, Café de Flore), offers something unique and intelligent for art-house audiences. Barichello’s film has an indescribable air of artistry thanks to the complementary performances of Stephen McHattie and Maria de Medeiros—one poetic and the other theatrical—that afford the viewer a sense of Beckett’s work, while the cinematography by Michel Le Veaux (Le démantèlement) highlights the alternative poetry and theatricality of the film. To each his own Beckett, indeed. Meetings with a Young Poet opens in Toronto at the Canada Square on Friday, April 18. What did you think of Meetings with a Young Poet?